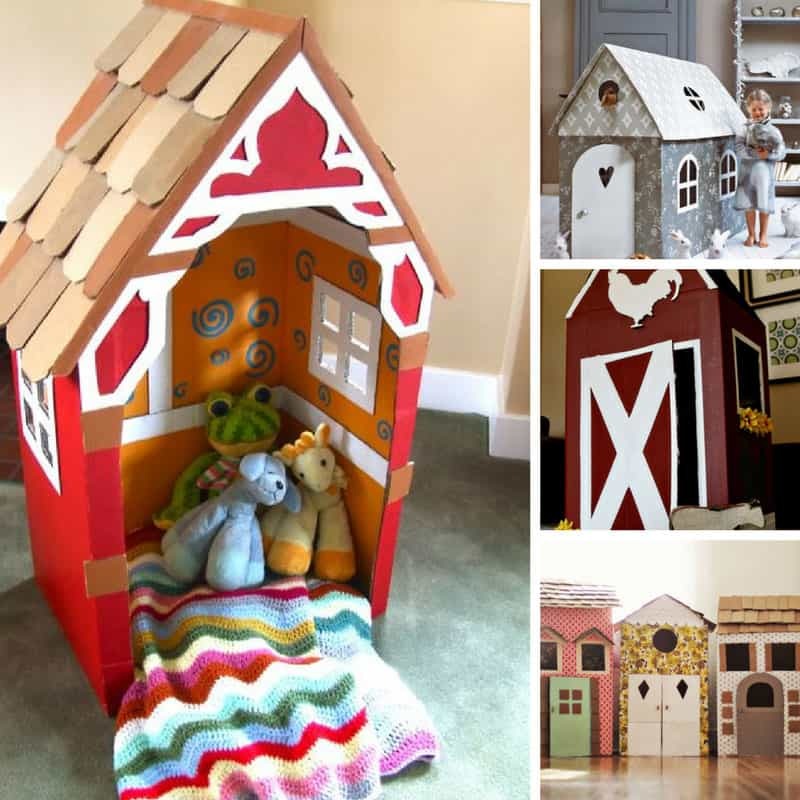 Home > DIY Projects > 15 Amazing DIY Cardboard Playhouses Your Kids Will Want to Live in! 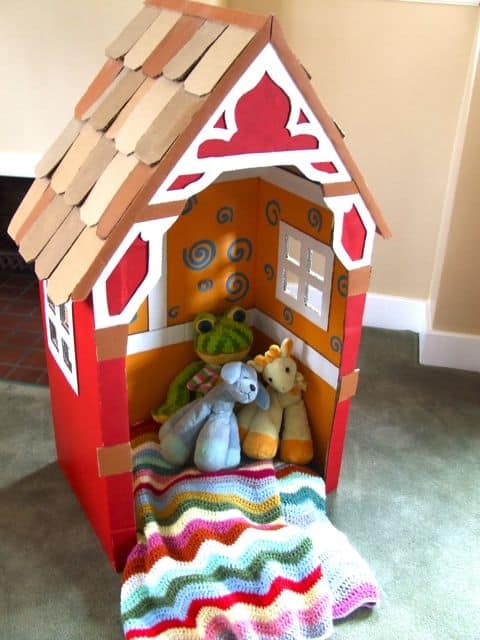 Be inspired by these amazing cardboard playhouses kids will love so much they’ll want to sleep in! And all from a cardboard box!! With the winter months stretching out ahead of us you might be wondering what on earth you’re going to do to keep the kids entertained, especially if it gets too cold to be outside. 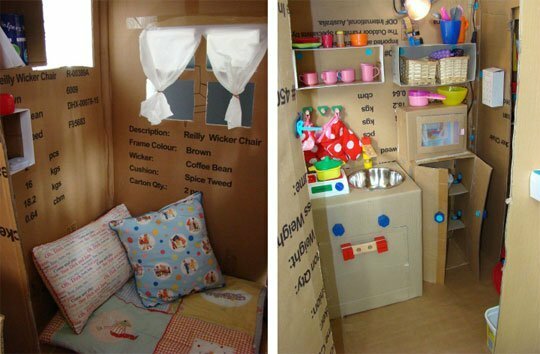 If you’ve got a few cardboard boxes in the corner of the garage and a few tools check out this collection of DIY cardboard playhouses kids will love – and be inspired to make a fun play space for your own children! I found tutorials for everything from playhouses with chimneys, to one that looks like a barn and even a mini street of cardboard playhouses! 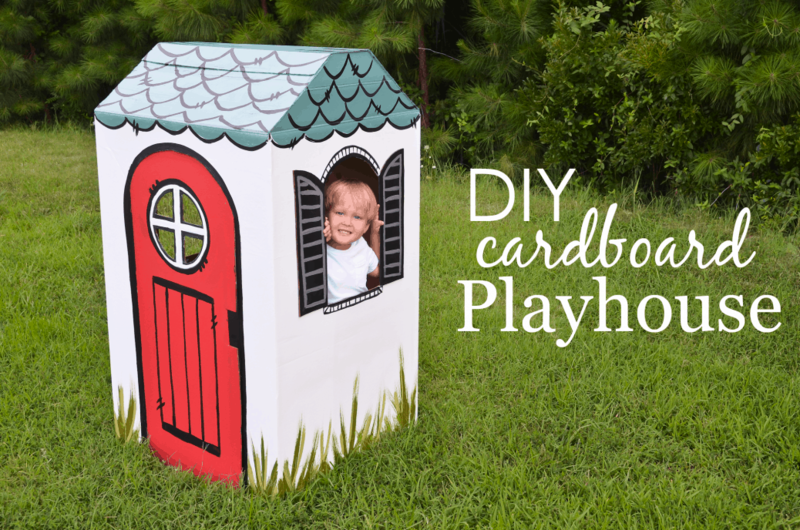 Cardboard Playhouses Kids will Love! This playhouse is adorable with it’s sloping roof and that round window in the front door. It was made from a single Weber BBQ box and the way they used the packaging for the roof tiles is ingenious! Top tip from this dad: If you want to use this playhouse indoors make sure the doorway is actually wide enough to fit it through once it’s built! 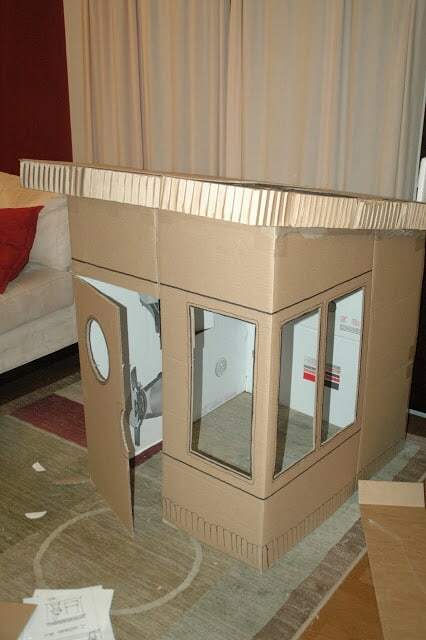 Here’s another playhouse built from a single cardboard box. This mom had the great idea of using construction paper circles to decorate the outside of the house so no messy paint job is required! Your playhouse design is limited only by your imagination, and we were blown away by Ollie’s House! How adorable is that double sloping roof, and it even has a chimney! And speaking of imagination… if you have so many ideas you can’t decide which one to bring to life don’t stop at just one! 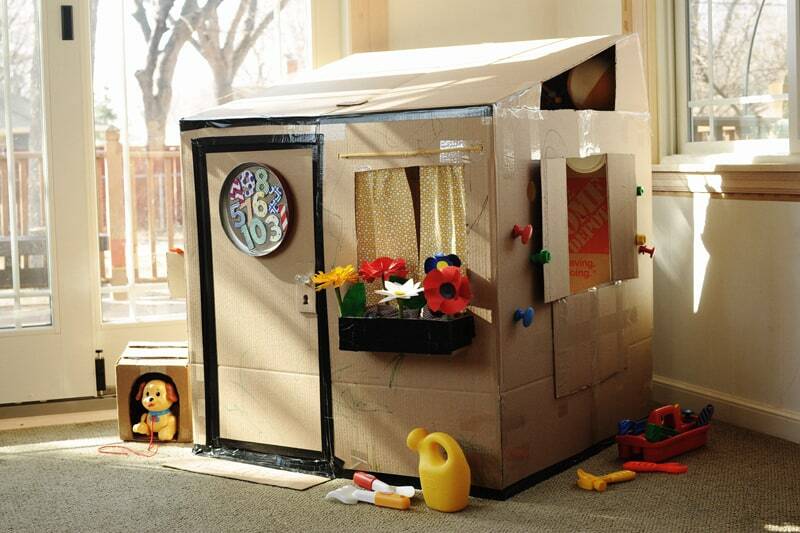 Just think how much your child would enjoy playing in a whole street of cardboard playhouses! 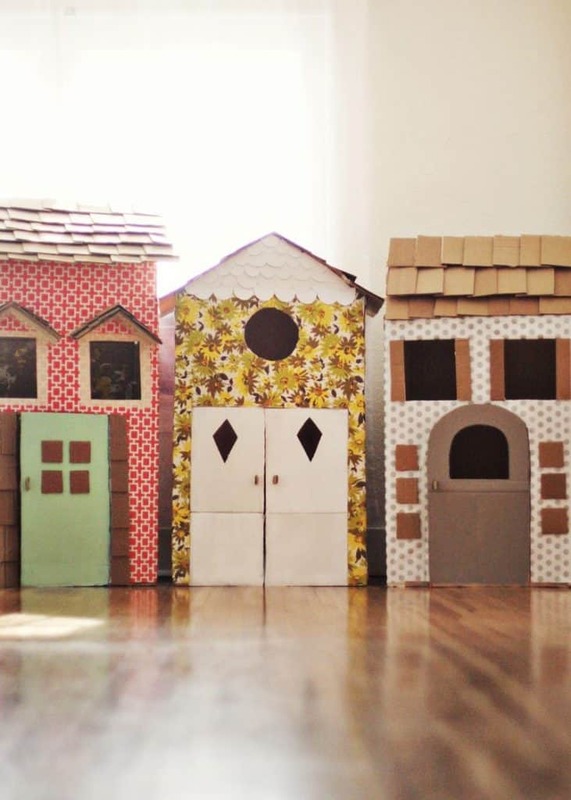 If you really want to build a kid’s cardboard playhouse but you can’t quite wrap your head around what it takes to build one check out this super cool time-lapse video! 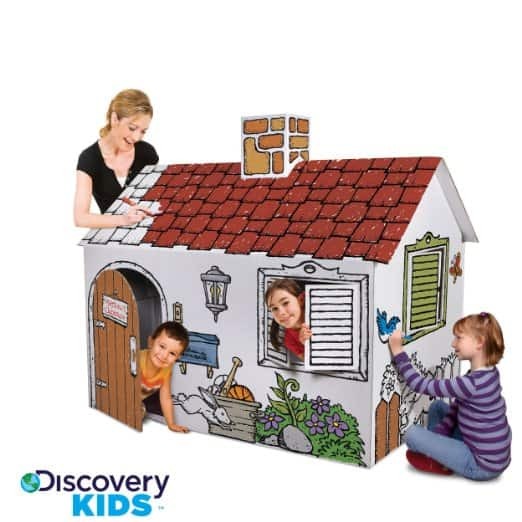 Of course if you just don’t have the time, or the skills, to build a DIY cardboard playhouse for your kids you could just buy them a Discovery Kids Cardboard Playhouse instead! The great thing about this playhouse is that your kids can have a blast colouring it in! 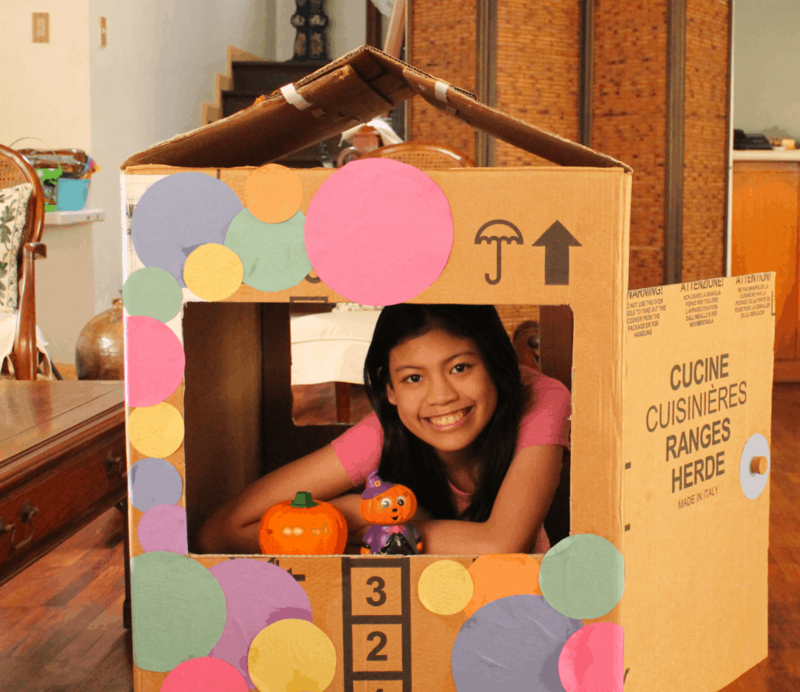 You might just want to stop with the playhouse and let your kids use their imaginations inside, but if you have some spare boxes why not put together a cardboard kitchen too! Want more? We have loads more ideas that you are going to love in our ==> DIY Play Kitchens collection! 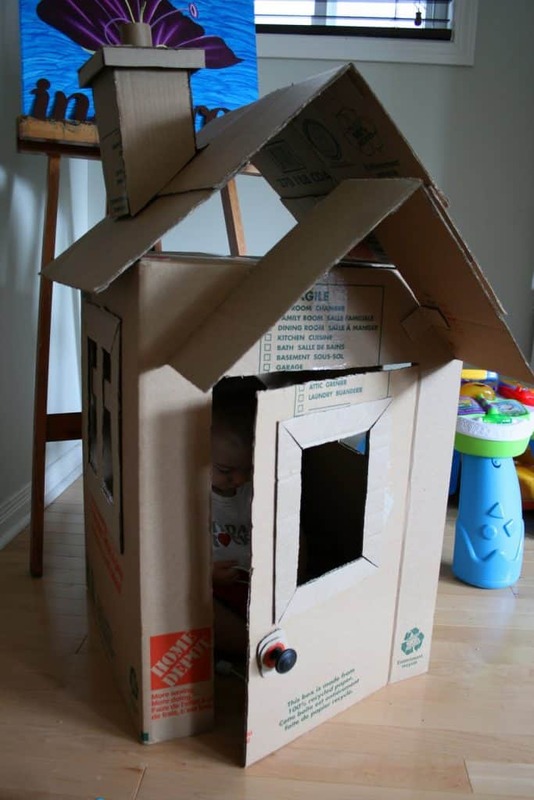 If your child really wants a cardboard playhouse but you just don’t have room in your house for a permanent fixture take a look at this collapsible playhouse design. It’s so simple to make and when they’re done playing for the day you can just fold it up and store it out of the way. Who says a cardboard playhouse has to actually be a house. 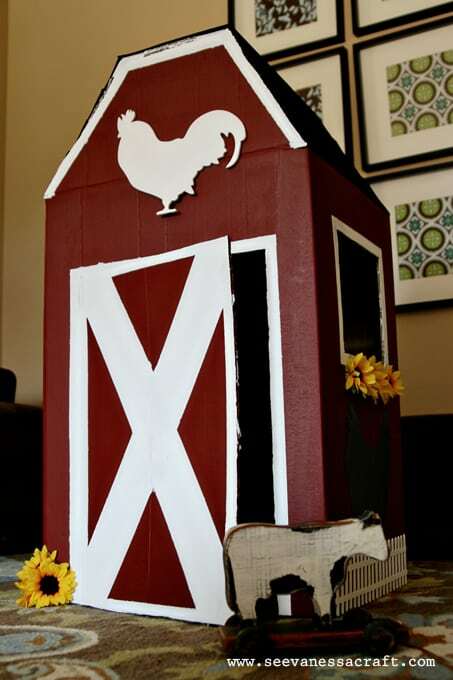 If your little one loves farms and animals why not make a barn playhouse instead? Sometimes it is the paint job that can make or break a playhouse, and we have to agree that this brightly coloured one really is the coolest playhouse on the block! 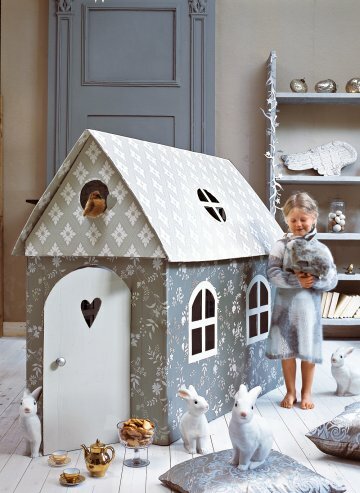 If you’ve been putting off making your own cardboard playhouse because you don’t think it would last very long take a look at this adorable design, which has been played with for four years and it’s still standing! Mom made it for her little one when they were just two years old so she decided not to put a door on so she could always see inside, and we really like how it turned out! Have you ever seen anything as beautiful as this? No one would ever know you had made a house out of an old cardboard box if you take the time to cover it in some amazing wallpaper! We know not everyone has 90 hours (!!) to spend creating a playhouse for their children, but this creation is just so amazing that we couldn’t not share it with you! 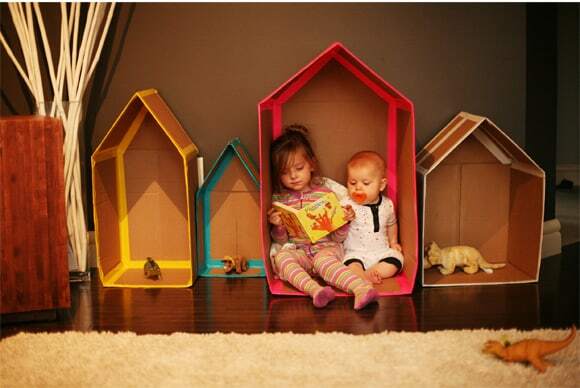 How utterly adorable are these cardboard playhouses just perfect for siblings to explore and enjoy together? 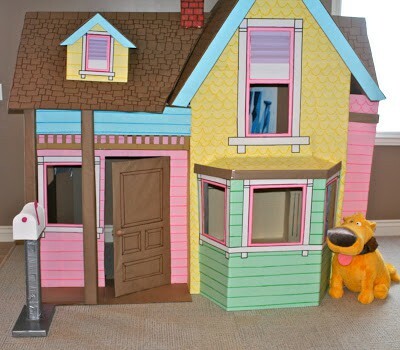 And we’ll finish up our collection with this scrumptious house complete with window box, key hole and mailbox!